GIGABYTE TECHNOLOGY Co. Ltd., a leading manufacturer of motherboards and graphics cards, today announced its latest Mini-ITX motherboards supporting 3rd generation Intel Core processors. The GIGABYTE Z77N-WIFI and GIGABYTE H77N-WIFI integrate a wealth of connectivity features that include Intel Wireless Display 2.0, Dual HDMI and Dual Gigabit LAN, making them the outstanding choice for any home theater, digital entertainment system or portable gaming rig. The philosophy behind these Mini-ITX boards is to simply create the most connected and digitally savvy board possible. By debuting Intel Wireless Display side by side with Dual HDMI and LAN, we’re really setting a new benchmark for flexible, highly connected, yet compact system building. Measuring just 17cm by 17cm, GIGABYTE Z77N-WIFI and H77N-WIFI Mini-ITX form factor motherboards combine a range of connectivity options that include Dual HDMI ports and Dual Gigabit LAN, plus an onboard WiFi/Bluetooth 4.0 module that also supports the new and innovative Intel®Wireless Display 2.0 technology. 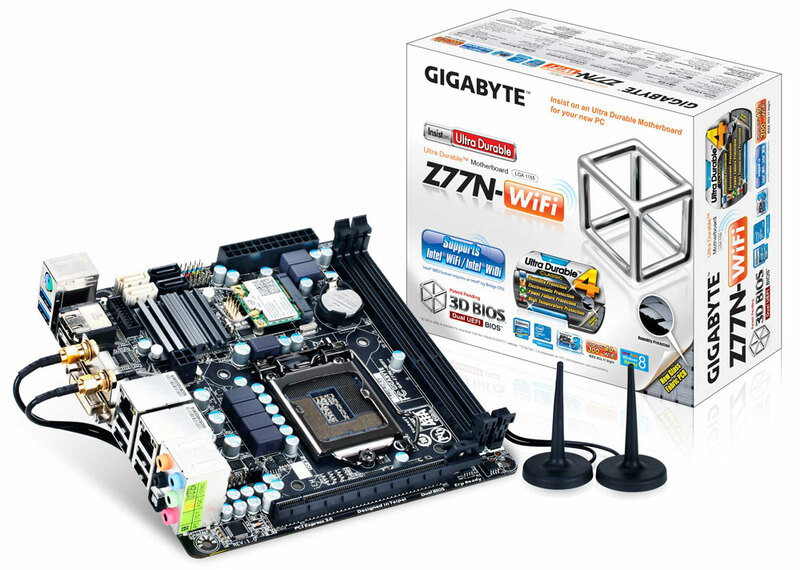 To discover more about GIGABYTE 7 series Mini-ITX boards please visit our web page here. Intel WiDi is a new technology that allows users to wirelessly share content being displayed on your PC monitor with a compatible display or HDTV. This not only removes the necessity of using untidy cables, but also allows you to easily display your videos and movies on a screen in another room. Intel Wireless Display 2.0 technology supports display resolutions of up 1080p which means you don’t have to compromise on image quality, while HDCP 2.0 and 5.1 surround sound ensure excellent audio.